[Timo] recently purchased himself a Acton Blink Qu4tro electric skateboard. Performance-wise, the board was great, but the controller left a lot to be desired. There were issues with pairing, battery displays, and just general rideability. Like any good hacker, he decided some reverse engineering was in order, and got to work. Initial results were disheartening – the skateboard relies on various chips of Chinese origin for which documentation proved impossible to come by. However, as it turned out, the board and controller communicated using the common NRF24L01+ transceiver. Initial work focused on understanding the pairing process and message protocol. With that done, [Timo] decided the best course of action was to redevelop a controller from scratch, using an Arduino Nano and NRF24L01+ to do the job. [Timo]’s Open esk8 controller improves driveability by removing delays in message transfer, as well as improving on the feel of the controller with a 3D printed chassis redesign. [Timo] now has a much more usable skateboard, and has racked up over 200 miles in testing since the build. However, if you fancy converting your existing board to electric, check out this project. Have you ever looked at your cat and thought “You know, my kitten really needs an electric skateboard!” Probably not, but this seems to have happened to [Kim Pimmel] while looking at his cat MIDI, so he decided to build one. This process involved building a simple, low powered skateboard with a Feather mainboard and motor controller combined with a laser-cut switch mechanism. When [Kim] puts a treat into the mechanism, the cat pulls the switch and the skateboard moves forward, moving into a brave new e-skateboarding feline future. MIDI looks somewhat unimpressed by this whole business, but I suspect that as long as the treats keep coming, he will be happy to keep on truckin’. Now, if he can just figure out how to persuade the cat to ollie, we will be really getting somewhere. Feline tomfoolery seems to be a regular pastime here on these pages, and more than just a quest for easy moggy-driven clickbait. A lot of cat feeders and cat finders abound, but this project isn’t the only cat-operated one. Our readers’ pets can probably spot an Arduino a mile away by now. [Nate] has made snowboarding cool with his Bluetooth connected board. Using 202 WS2812 LEDs carefully wrapped around the edge of the board and sealed with a conformal coating, it’s bright and waterproof. It’s controlled with an Arduino Nano and a Bluetooth classic board, as well as a large swappable USB battery bank; he can get roughly four hours of life at full brightness on his toy. Where it gets even cooler is with a six-axis gyro connected to the Nano, which tracks the board movement, and the lights respond accordingly, creating cool patterns based on his speed, angles, and other factors. The app used to control this intense ice-rider is a custom app written using MIT App Inventor, which has the ability to work with Bluetooth classic as well as BLE. This came in handy when he made the 100-LED skateboard, which is based on a Feather with BLE and a large LiPo battery. The challenging part with the skateboard was making the enclosure rugged enough (yet 3D printed) to withstand terrain that is a lot less fluffy than snow. The connected skateboard is controlled by his phone and a Feather. The case is very rugged to protect the electronics. We’ve seen others use flashlights and a professional connected board, but it’s been a few years and we’re due for a refreshing (and nostalgic) look back on the winter. [Matt Obal] had a problem. The local skatepark was too far to skateboard, but close enough to bike. Carrying a skateboard on a bicycle is a rather awkward (and unsafe) maneuver. [Matt’s] answer to the problem is Truck Stop, a bicycle mounted skateboard carrier he developed and is manufacturing himself. [Matt’s] work on Truck Stop began about a year ago, with his purchase of a 3D printer. He designed a seat back mounted device that secures the skateboard by wedging between the truck and the board itself. The design is printed in PLA and is hollow. Truck Stop’s strength comes from being filled with resin and fiberglass cloth. If you’ve worked with resin, you probably know that some formulas get hot while they harden. This caused a few melted prints until [Matt] figured out that a dunk in cold water at the right time would allow the resin to complete it’s hardening process while keeping the heat below the melting temperature of PLA. He’s since switched to a different resin formula that generates less heat. [Matt] is selling the Truck Stop at his website, and spent quite a bit of time working on a silicon mold so he could cast as many mounts as he wanted. The problem was fiberglass poking through the final cast part. In the end, he decided to stick with the resin filled PLA of his prototypes. We recently posted about [James Bruton]’s most excellent oversized LEGO electric longboard. Well, now he has completed the project by tidying a few things and building oversized versions of classic light-up bricks to serve as headlamps and the tail light. Most importantly, he’s hitting the road with it! He built a LEGO-looking enclosure for the battery as well, based on a 2×6 brick. The battery pack sits behind the motor with the tail light on top and holds the radio control receiver as well the twin LiPos. The head and tail lights pack 24-LED discs and are controlled by [James]’ FS-GT2B 3-channel RC transmitter. Its third channel is just a button, and he can trip that button to activate the lights with the help of a Turnigy receiver-controlled switch. For an added touch he printed some LEGO flowers and a minifig, suitably oversized, and took the skateboard on the road. The thing has some zip! [James] kept his balance while holding the controller in one hand and a selfie stick with the other. The headlamp housings fell off, and a while later the minifig fell off. Fortunately [James] was able to snap them back into place, in proper LEGO fashion. [James] runs XRobots and also served as a judge for the 2016 Hackaday Prize. We wrote up his Star Wars builds a while back, as well as his tutorial on mixed reality filming without a green screen. [James Bruton] built an electric skateboard out of oversized LEGO bricks he printed himself, and equipped the board with an excellent re-creation of a classic motor. He began by downloading brick, gear, and pulley designs from Thingiverse and printing them up five times their normal size, taking 600 hours. The deck consists of 8M Technic bricks lengthwise and 4M bricks crosswise, with plates covering top. There’s even a monster 5×6 plate that’s clearly courtesy of a parametric brick design because you won’t find that configuration among LEGO’s official parts. 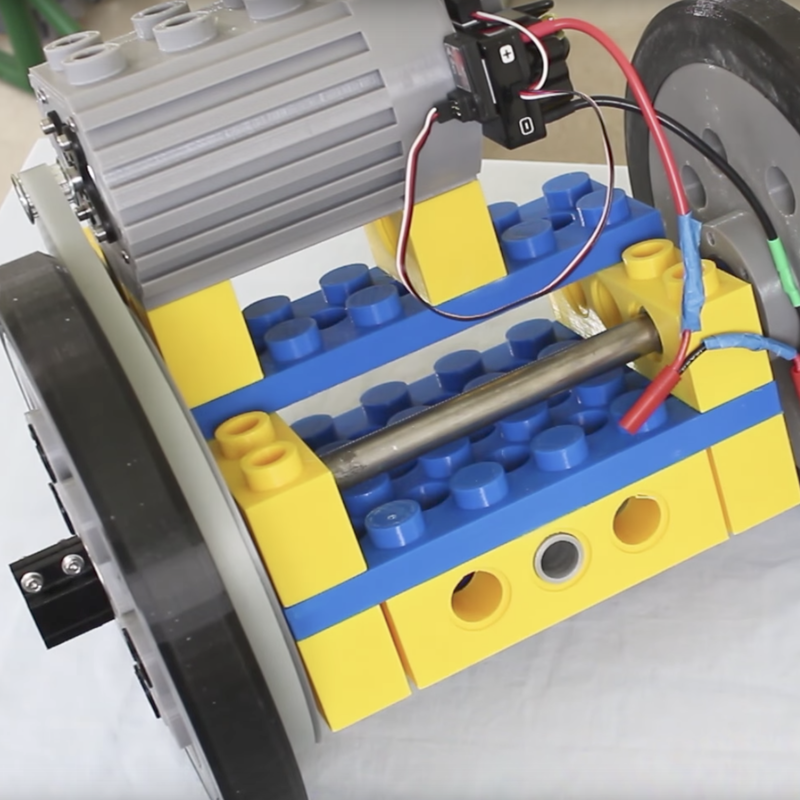 The coolest part of the project is probably [James]’ re-creation of an old school LEGO motor. He sized up a 6216M Technic motor originally rated for 4.5V swapping in a 1.5 kW, 24V motor controlled by a 120A ESC and powered pair of Turnigy 5000mAh LiPos wired in series. [James] had to design his own casing in Blender because couldn’t find a file for the original LEGO part—pro tip for the future, LDraw has the 6216 design and it can be dropped into Blender. Another nice touch are the wheels, with hubs based off upsized 40-tooth Technic gears with Ninjaflex tires that weigh half-a-kilo each and took 32 hours apiece to print.